The Houston Ship Channel — already closed for days since last Friday afternoon a large-scale contamination of leaked chemicals from the Intercontinental Terminals Co. (ITC) fire spilled Benzene and other dangerous chemicals into and over waterway (especially via toxic smoke clouds) — could remain shut to regular through traffic for several more days, the Coast Guard has confirmed, trapping dozens of inbound and outbound oil and LPG tankers. 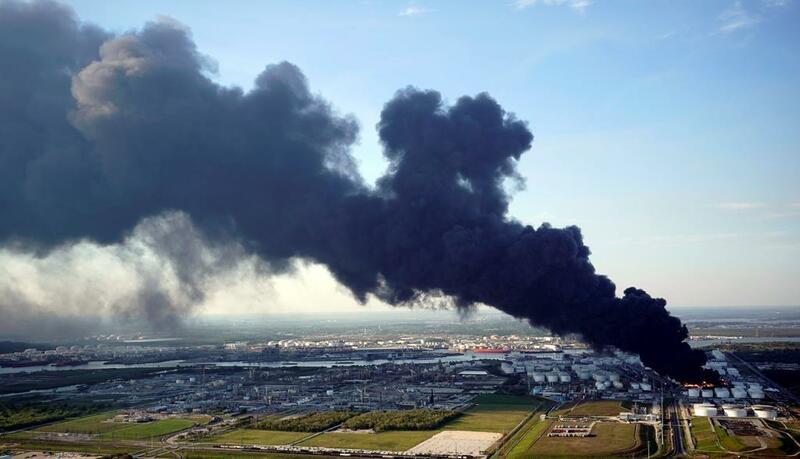 At the end of last week’s days-long massive fire engulfing multiple petrochemical tanks at the oil facility, emergency crews led by the Coast Guard noticed elevated Benzene levels in the area, and even what was described as a “benzene plume” hovering above the water. This as Deer Park area residents complained of illnesses ranging from nausea to headaches to irritation and burning in the skin, eyes, nose and throat from the disaster which began on March 17. Fox Business has quoted a Coast Guard official who said Monday morning it could be “several more days” before a key section of the Houston Ship Channel will be opened up amid continuing clean up efforts. It’s a test to see when the Houston Ship Channel could be reopened. Local sources cited that roughly half of the Ship Channel, vital to multiple industrial and energy sectors, was cut off from the Gulf of Mexico and Gulf Intracoastal Waterway, leaving some 31 ships stranded and waiting to move into or past the affected area as of Monday morning. Later into the afternoon on Monday reports counted some 60 ships as blocked from getting through by emergency management operations. Days into last week’s blaze which sent a plume of smoke a half mile into the air, city officials had released a statement alerting the public to elevated levels of benzene, described as “a colorless, sweet-smelling chemical that can be derived from natural gas, crude oil or coal, can cause cancer, infertility and birth defects in the developing fetus of pregnant women among other things” according to the Centers for Disease Control and Prevention. Vessel traffic has begun to loosen up slightly today. One ship has moved through the spill area inbound today, while another has been boarded inbound, according to shipping agency Moran Shipping. Another vessel sailed outbound, passed the spill area, and headed to a decontamination berth. By around 3:30pm ET ships with freshwater drafts under 34ft will start moving outbound, but will be inspected for contamination before being allowed to continue, according to Moran. Oil facilities inside the spill area include Houston Fuel Oil, Jacintoport, Vopak, and ITC. 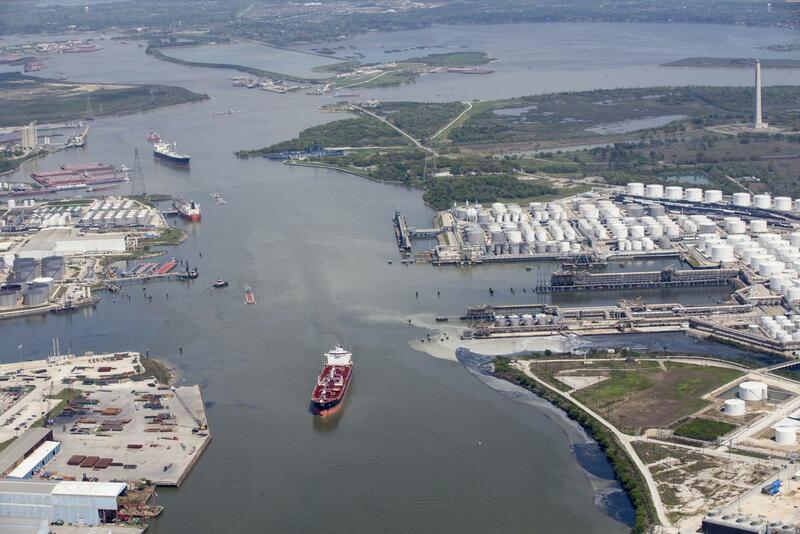 The Houston Pilots plan to prioritize outbound sailings from the port, once ships are deemed able to move through the spill area without contamination, said Moran. ITC response crews are still working on pumping thousands of barrels worth of benzene-laced refining byproduct and other chemical compounds out of the breached and damaged storage tanks since the fire was finally extinguished by the weekend.